The 2019 Big Mable Towable is Here!! 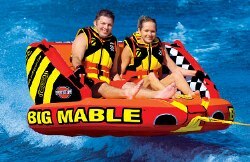 The 1-2 rider SportsStuff Big Mable is designed for water sports enthusiasts everywhere! The Big Mable towable offers an abundance of handles and EVA foam pads for added comfort. This towable tube has two-towing systems. Plus the SportsStuff Big Mable water tube is great for relaxing in the sun. It's like having three products in one! When it comes to 2 person towable water tubes The SportsStuff Big Mable can't be beat. Sit down and hold on for the water sports ride of your life. Next, turn the Big Mable around and connect the ski rope from the second boat towing position and kneel on this towable tube for more fun in the sun. All water sports lovers have to take a break sometime. The SportsStuff Big Mable towable is also a great water lounge. Sit back and relax for a slow inflatable towable ride or just lounge on the water. We also have grat prices on the SportsStuff Mable and Super Mable one and three rider towable tubes. See the SportsStuff Big Mable 53-2213 in ACTION! The 2019 Model is a ton of fun! See the SportsStuff Big Mable in ACTION! The 2019 Model has a one year warranty. Just had to have this and we were not disappointed. Quality product that will give is years of fun for the family. We received it quickly and were kept informed of progress throughout. Highly recommend this company - thank you so much!